2000 Copper Buckskin Stallion by the Legendary Frenchmans Guy. 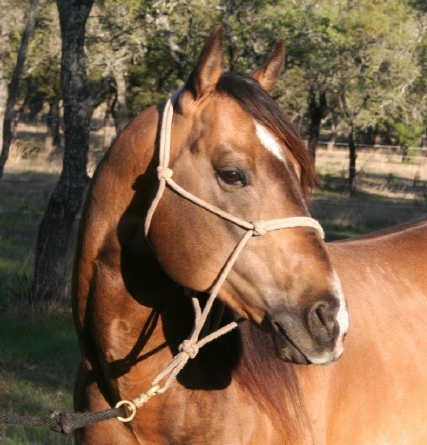 A leading sire of barrel futurity money earners, top leading derby sire, top leading team roping futurity Sire. $3.5 Million+ in lifetime progeny earnings including Nother French Girl ($17,516+); Saintly Guy ($15,500+); More French Lumas ($8,203+); Coy French Silk ($8,060+); Sx Frenchmans Moca ($10,913+); SX Frenchmans Vanilla ($140,000+), Triple Crown Futurity Champion, 5-time Futurity Champion, 2-time Derby Champion, #2 Money Earner in 2002); FM Bacardi Freezer (Champion Fizz Bomb Classic Pole Bending); and many, many more... Frenchmans Guy is a 3/4 brother to Millionaire/World Champion Barrel Horse French Flash Hawk aka "Bozo". Chico also has the great Pacific Bailey on his papers! A truly great race horse, Pacific Bailey had the unique combination of speed, athleticism and good looks. With a SI-100, Pac had 24 starts with 13 wins, 4 seconds & LTE of $15,073. In the process, he was a stakes winner & set 4 track records. In the show ring, he earned 24.0 halter points with 7 grands and 6 reserves. Pacific Bailey was an AQHA Champion by the age of four with a race ROM (earned in 1965) and a Superior in racing (Earned in 1966).